The heart of our company is our transport fuel delivery services. 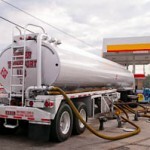 Fisher Transports, LLC modern fleet of trucks has provided transport tanker fuel deliveries to Shell and unbranded independent retail gas locations east of I-95 for over 25 years. 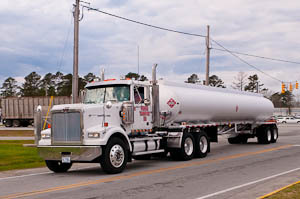 We also deliver tanker loads or “split” partial loads of fuel to many industrial, institutional, marine and agricultural customers all over the Eastern N.C. area. We pride ourselves on giving prompt, efficient customer service at competitive market rates. If you are considering bulk delivery services call 252-633-6300 for a quote on current prices. as they change almost daily. For emergency calls after 5pm Monday-Friday and weekends, please call 252-633-6300 ext. 22 and leave a message. Your call will be returned as soon as possible. Fisher Oil Company provides “short truck/tank wagon” deliveries of kerosene and off-road #2 dyed diesel to homes, businesses, agriculture and industry from 50 gallons to 2800 gallons. Emergency Calls after 5 pm and weekends Call 252-633-6300 ext.0 and leave a message. Will respond next business day. Credit card rate is 3½% more to offset bank charges. Call before 11 am for same day delivery. Fisher Oil Company offers “bulk rack sales” of dyed non- highway diesel and K-1 kerosene for heating purposes, farmers, construction companies, landscapers and other businesses at our Riverdale bulk plant (110 Riverdale Rd. ), Monday thru Friday 8:00 am to 5:00 pm. Customers must use approved, properly identified and secured containers. Please call us for a quote today at 252-633-6300 as fuel prices change almost daily.